The original map is now outdated with regard to this claim. 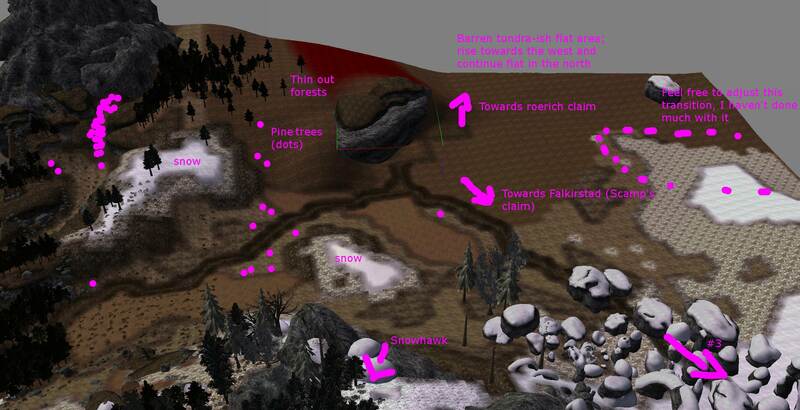 An updated outline of this claim area can be found on the map below. This claim will now not feature Falkirstad, as it has been moved further north-east as discussed in this thread. Now that this claim doesn't have a settlement, what should go here? Perhaps some Reachmen activity? The Nourhtu tribe could have a presence here. A couple of Nourthu tribe camps would be fitting yes. Just 1-2 huts each, and then preserve the larger camps for the area north of here. Possibly a watchtower somewhere too? This file should be used as a base for this claim. It contains the border to claims 5+6. Hi spineinside, I would like to handle claim borders a little differently to how TR does them. My proposal is that either you detail a little beyond your border to #3, that is, one third of each cell of the westernmost column of claim #3, or I detail a little bit beyond the #3 border, which would be around one third of each westernmost cell of your claim. Then, either of us uploads that cell column so that the other person can include it in their claim. I hope that makes any sense the way it reads. It's basically what I've been doing together with berry for our recent claims, and it worked out very well. No block-y borders. At this point, I'd also like to emphasize that I have uploaded the border to claim 5+6 above in this claim thread, and it should definitely be used as a base for whatever you have planned. Yeah, sounds good to me, that should make transition between claims blending nicely. I will seperate the cells for this claim when heightmaps will be ready and then return to you. Alright here's a base file for you, should have all cells + northern border, minus the eastern row that borders my claim #3. Border will follow shortly. Sorry for the delay. Thanks minerman. For the record though, I'm not taking this or doing any direct work on it, just loading it alongside my claim to get an idea of the surroundings. Here are your border cells, sorry for the wait. -the transitional vertex paint in -108,25 seemed to suggest that you accidentally overwrote a couple of dirt patches with grass, also causing two texture seams. I re-added the dirt in these places. -The entire claim was full of texture seams, which was arguably the biggest issue (since contrary to most errors/nitpicks, it's actually quite visible in-game). Remember: every time three different textures meet, there will be a texture seam. Just press shift-c and look for these places. That's all it takes. Also keep in mind covering with groundcover does not suffice. Some people might have it disabled on a low-spec machine. -I think you're a bit too soft with your vertex paint, could be somewhat more generous at times. Mostly a subjective style issue, but vertex paint is generally perceived brighter in game, so applying a bit more can never hurt. -bleeding grass into rocks is fine, holly and bushes not so much.